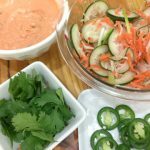 Gluten-Free Bánh mì with Tofu, a Vietnamese-inspired sandwich with quick pickled cucumbers, carrots and radishes, a spicy aioli and a bit of cilantro on a soft baguette. Perfect for lunch or dinner! 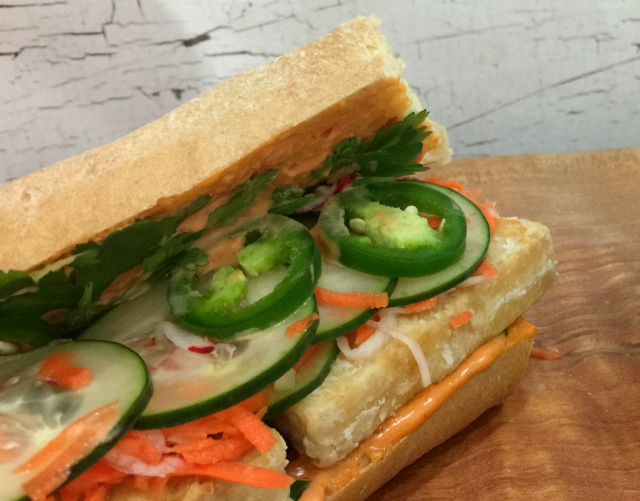 If bánh mì is new to you, I’ll try my best here to tell you a bit about it. I have limited knowledge of Vietnamese food but have been doing a bit of research so I know more about what I am eating and what I’m sharing with you. Bánh mì is actually a reference to bread, bánh meaning bread and mì meaning wheat. When I see bánh mì served, it is usually with a pork filling although I’ve seen a wide variety of fillings in my area including pork with chicken pate, meatballs, sausage and of course, crispy tofu at the bánh mì closest to home for me. 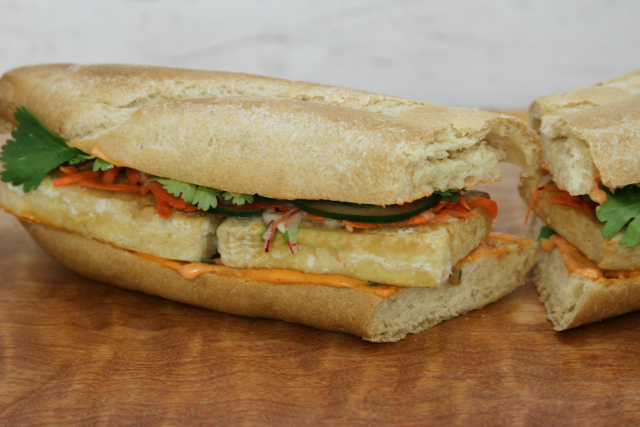 When made with a vegetarian filling, it is called bánh mì chay. Let’s talk about ingredients for a minute before moving on to the recipe. I’ve used the super firm tofu from Trader Joe’s again. I love the texture of this tofu, it’s truly firm, unlikely to crumble, and doesn’t take long to drain. If you are new to cooking with tofu, this is a great way to get started. I’ve used Just Mayo to make the spicy aioli. And because I need to remove the mì (wheat) from this bánh mì, I’ve used a Schar baguette. This is the one that comes two to a package. This recipe is perfect for making 4 sandwiches, which is exactly what you will get from two of the baguettes. Andrea Nyugen has several more vegetarian ideas for bánh mì on her site, Viet World Kitchen. 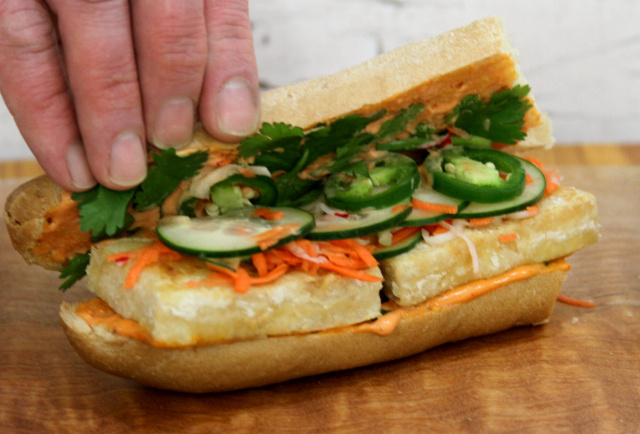 She also has a book that I’ve added to my cookbook wishlist, The Banh Mi Handbook. I’m on a cookbook-buying hiatus while I work on my own project, but this one sure has tempted me. With a few modifications, I would bet many of the recipes can be made gluten-free and would work for many of us with a special diet of some sort. 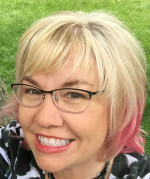 A conversation for another time, perhaps, on how we can all use “regular” cookbooks and make modifications so we can continue enjoying a diverse array of food. But for now, let’s get on to the recipe! Pickle vegetables first. Combine the carrots, cucumber and radishes in a bowl with rice wine vinegar and sugar. Toss to combine, cover and refrigerate for at least 30 minutes before serving. Make spicy aioli next. Stir together mayonnaise, sriracha and green onions. Cover and refrigerate until ready to serve. If your bread requires warming or to be finished liked the Schar baguette, now is the time to do this. Next, cook the tofu. Heat oil in a deep skillet. Dredge the tofu slices in arrowroot or cornstarch, just enough for a light coating. Fry in hot oil over medium heat, about 3 minutes on each side until lightly browned. While tofu is cooking, prepare the baguette. Each Schar baguette makes two sandwiches. Cut in half lengthwise and then slice the baguette open. Generously spread spicy aioli on the inside of the top and bottom of the bread. Once tofu is done cooking, transfer to a paper towel lined plate to absorb any extra oil. You are now ready to finish assembling the banh mi. Place two tofu slice atop the bottom piece of bread for each sandwich. Top with pickled vegetables, sliced jalapeno and cilantro leaves. I made this for dinner tonight, and it was quite delicious! My partner is going vegetarian, and I’ve never cooked with tofu before. We were both incredibly pleased with the outcome, and will definitely make it again!! !